My husband and I have very different approaches to vacationing, which I suppose translates into different styles to approaching life in general. 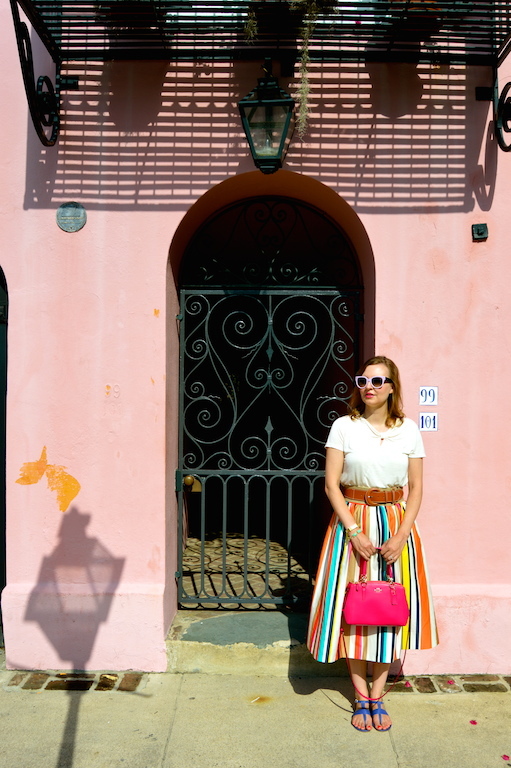 Take, for example, our recent trip to Charleston, SC this summer. Before we left, my husband had printed a two-page itinerary of places to see, complete with hours, addresses and directions. I am more like, "let's just meander around, get lost and see what we discover" type of person. But, as the old adage goes: opposites attract and I think there is probably something to gain from both approaches. 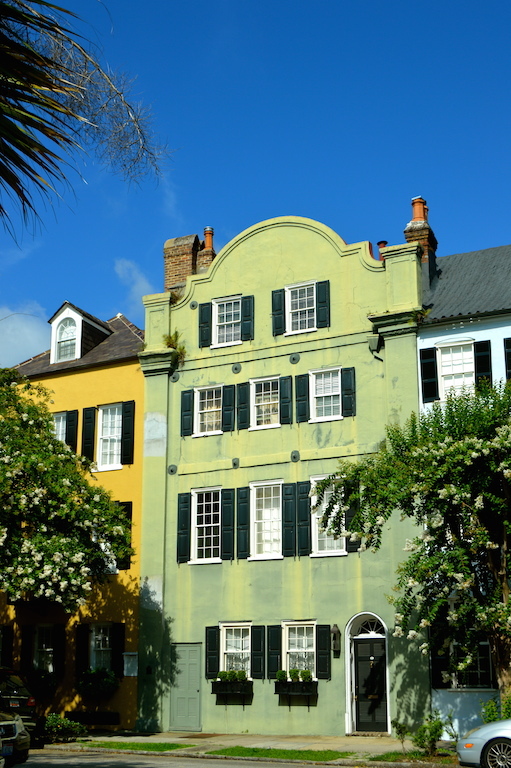 The one thing I did plan (in fact, it was so important that I added it to my husband's itinerary when he wasn't looking) was to visit a strip of colorful, historic homes in Charleston known as "Rainbow Row". 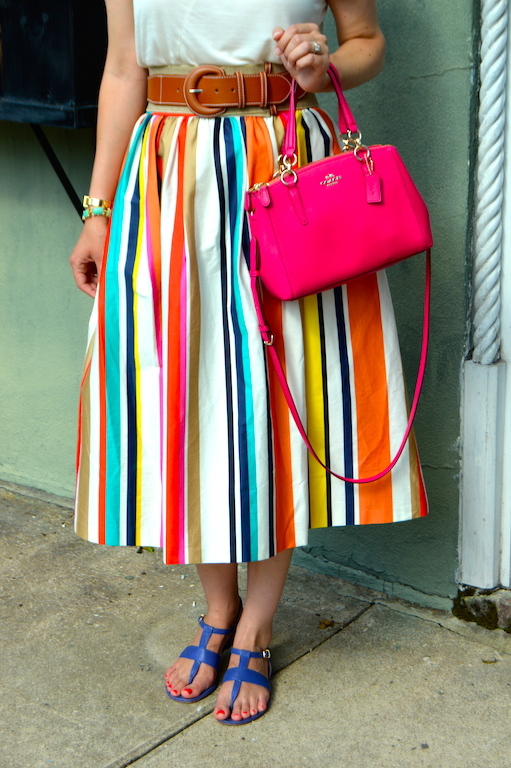 So, obviously, on the day we went to Rainbow Row, I had to wear something colorful like this rainbow skirt from Alice and Olivia. 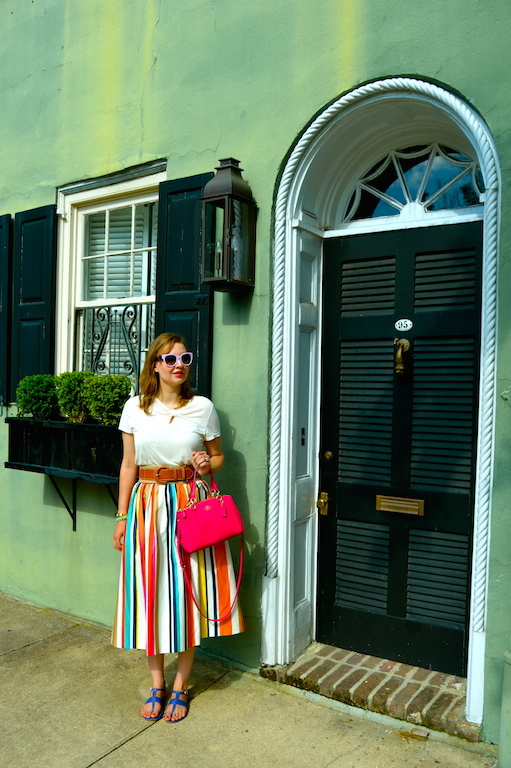 Although it is a midi length skirt and made out of somewhat thick material, I imagine it was much more comfortable than what women during the 18th and 19th century would wear strolling the streets of Charleston. On one tour of a historic house in the area, the docent, dressed in mid-19th century garb, told us that women during the time were not allowed to reveal their ankles and if a gentleman happened to see them, it was his obligation to propose marriage! Well, no one proposed to me after seeing my ankles on Rainbow Row, but it is the 21st century! Below you will see the rest of my pictures from Rainbow Row. The word "stroll" implies a certain leisureliness, but truth be told we were actually sticking to a schedule (my husband's, of course) in which we had to get to a tour of a house within 15 minutes of arriving at Rainbow Row. I hope the pictures look effortless and carefree, but in reality we were on a tight schedule! Your photos turned out wonderful! 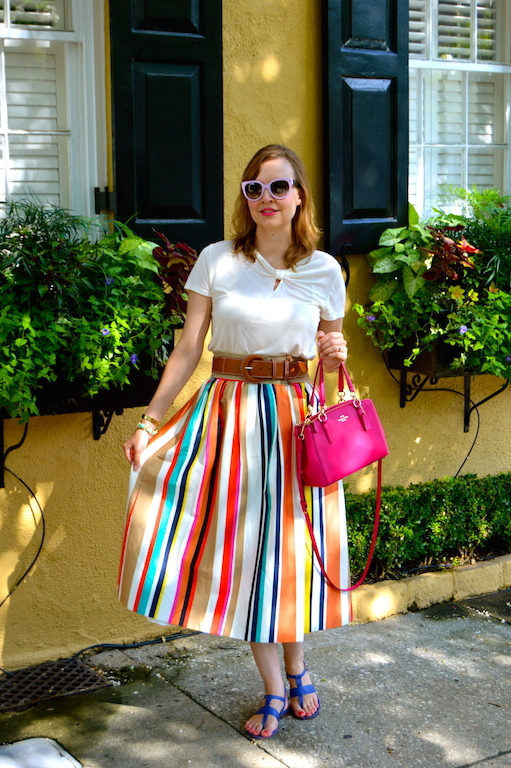 That is the perfect skirt for this outing. I have turned into a schedule person after years of never planning. I find we manage to see and do much more with an itinerary, even if we don't stick to it all the time. In my husband's defense, we did get a lot in during our trip. Since we had a very limited amount of time in Charleston being on a strict schedule was definitely the best approach! Loving the fun skirt. The sunnies are so pretty as well! You're making me wish for a return trip to Charleston! It's such a gorgeous city and Rainbow Row was one of my favorite areas. Such a gorgeous skirt! It's the perfect item to wear for the location. Gorgeous photos too! How darling!!! Those are the perfect back drop to these photos! The skirt is perfect (of course, I think that because I'm a color girl too!! ), the backdrop is perfect (each time) and you look well relaxed. My husband & I are planners by nature, but I have come to enjoy just playing it by ear at times. Sometimes I think that's when the real fun begins!! Oh my goodness...that skirt is BEYOND fabulous! Gorgeous look! 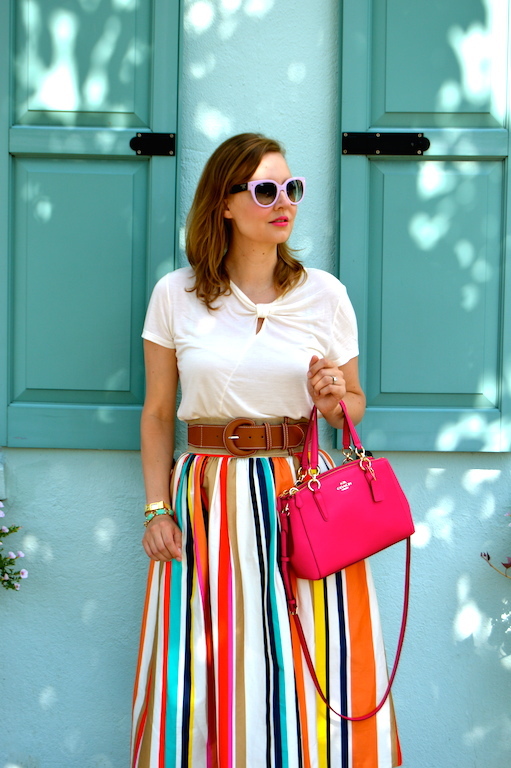 I love this look, and how fun is your skirt! I'm loving all the colors in your photos! how cute-this looks like it could be a Kate Spade add! Love this skirt and the back-drop! What a gorgeous skirt - I'm in love! 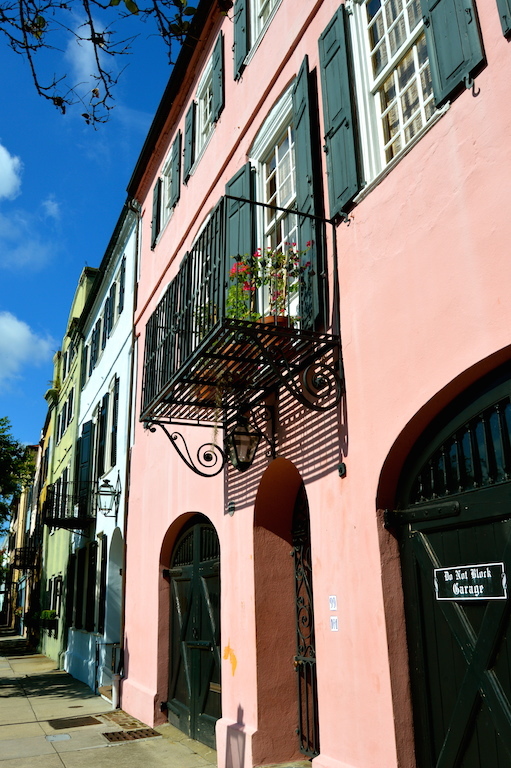 I love charming old neighborhoods, and this one is so beautiful! How lucky you are to have been able to stroll the streets :). You were right in thinking your skirt was perfect for the occasion. I get a happy feeling just looking at it; so cute! What a picturesque setting! Your skirt is so appropriate! I love all the color! 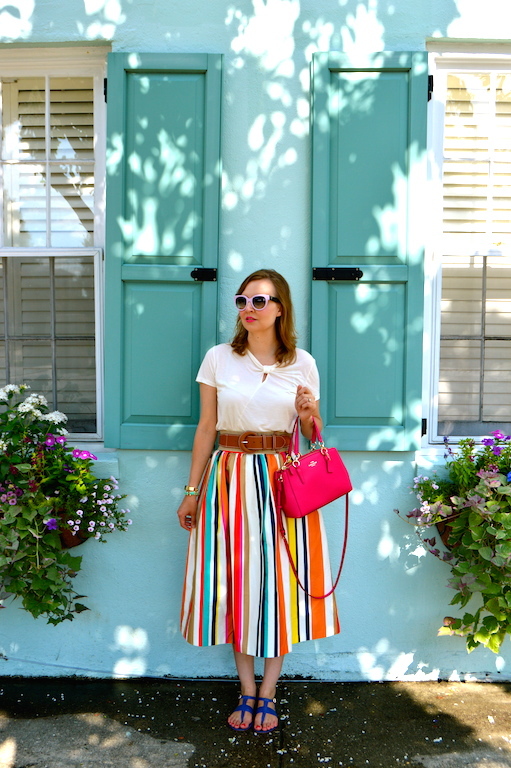 Both Rainbow Row and your skirt are gorgeous!! You look relaxed and like you're strolling, so the tight schedule is not evident at all :) I think my vacation style tends to be more like your husband's, but sometimes I like to just abandon my planning nature and just go with the flow when I'm away from home.